IBC 2017 is a global conference, featuring a slate of some of the foremost thought leaders in the world. IP technology in the global broadcasting landscape will be prominently highlighted. We’ll be showcasing our newest IP equipment, with an emphasis on key gear for international broadcasters. With remote IP audio codecs like ACCESS NX, guest interview solutions like Opal, video over IP technology like LiveShot, and more, we’ve got answers to a wide range of broadcasting challenges. ACCESS 2USB has already made enormous waves in Europe and elsewhere, and ACCESS NX is the next step in the ACCESS IP codec line. ACCESS NX is the result of a decade of IP audio transmission advancements and is refined for the ultimate remote experience. Perfect for a wide range of applications – including ENG, sports announcing, talk show hosting, community outreach, and more – ACCESS NX has been built from the ground up, implementing a decade of knowledge into a brand new hardware platform. ACCESS NX runs on CrossLock, Comrex’s custom reliability layer that enables both powerful error correction and network bonding. Rather than simply splitting data between two networks, CrossLock monitors each network in real time and dynamically adjusts network usage based on performance. Combine that with a suite of network enhancement tools, and CrossLock can turn unreliable wireless service into a rock solid broadcast-ready link. Click here to learn more about ACCESS NX. ACCESS NX is now available to order! Click here to find a dealer. 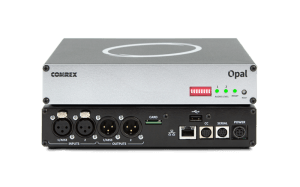 Comrex Opal provides near-studio quality audio by leveraging equipment guests are already familiar with (i.e. smartphones and laptops). Perfect for coordinating call-ins with guests who have no technical experience, Opal enables users to connect to the studio by simply clicking a link. Opal makes it possible to do long interview segments in HD voice quality, without requiring guests to install apps or fiddle with settings. Opal works by activating the Opus encoder built into commonly used browsers – including Chrome, Firefox, Microsoft Edge and Opera. As a result, Opal can connect to any computer or Android device with one of those browsers installed. iOS users will be able to connect to Opal with a free Comrex app since Safari browsers do not yet support the Opus encoding algorithm. Click here to learn more about Opal. 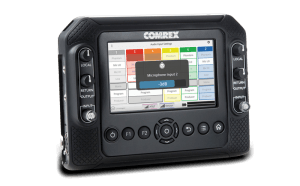 Comrex LiveShot delivers live, two-way, HD video and audio over a range of IP networks at latencies as low as 200mS. With sophisticated CrossLock VPN technology, LiveShot goes beyond bonded cellular, making use of even the most challenging 3G/4G, Wi-Fi, and satellite networks. Compact with a versatile interface that can be camera-mounted or slung over your shoulder in LiveShot Pouch, and light weight at only 3 pounds, LiveShot is portable and designed for the most demanding field broadcasts. Used by TV stations, networks, sports franchises, and government organizations for a broad range of applications, LiveShot is ideal for streaming low-latency broadcast quality audio and video from anywhere Internet is available. LiveShot uses CrossLock VPN to create a stable and secure connection across the public Internet. CrossLock adds intrusion protection, encryption, and forward error correction. 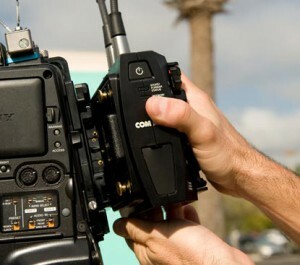 Using CrossLock, LiveShot units are able to connect at the touch of a button. Click here to learn more about LiveShot. Interested in visiting us at IBC 2017? Add us to your planner here.